Back again!!! Somehow I always find myself running short of time. The moment I sit infront of the computer,my little one comes running and demand that we play 'cake game' . Computer has started capturing her interest. If not that DH asks about his investments which Iam supposed to look after. Once that's done, it would be my turn to look for matter related to my university classes....and after all these the turn of poor needlework comes..sigh!!! Today's block took me a long time to stitch inspite of being one of the smallest. No, it was not because of Chinese knots...it was due to the basket stitch.I had to pull out the stitches quite a few times. It still has not come out that well, I need a lot more practice. The stitch is not difficult, it is infact just cross stitches...maybe my patience is running thin as Iam nearing the end of the whole project. The center is filled with Chinese knots or Challah work ,as it is called here in India. Here is the tutorial for Chinese knots/Challah work. I tried floss blending on orange flower - two strands of orange with one strand of white. Beautiful block Deepa. I just love Chinese knot. 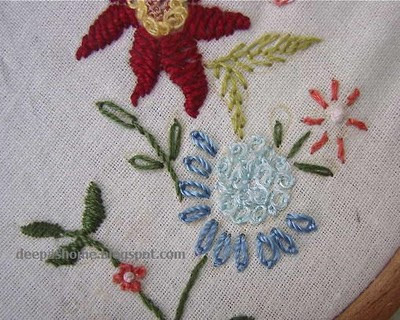 Years ago, when I first came to know about French knot, I didn’t know how to do it. So, when I had to stitch a knot, I used to make a tight Chinese knot. I thought that it was also a French knot made with a single wrap. But when I came through your tutorial I got to know that it was actually Chinese knot…..:P!! chinese knots look very beautiful!!!!!!!!! 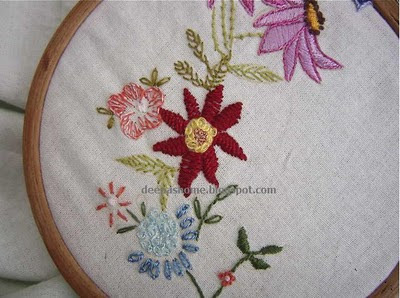 After seeing your embroidered flowers I have decided to use as many different stitches as I can in my future projects. Deepa all of your stitches are beautiful, these knots are lovely, so open and airy. Hugs.